Where’s the elevator music? These sturgeon are ridin’ in style! Image: Danny Caneff. 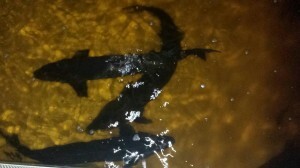 Sturgeon go back to the river to spawn safely. But hydroelectric dams often block rivers, forcing fish to spawn in more dangerous spaces. The River Alliance of Wisconsin is giving those fish a little boost. This podcast was originally published on CurrentCast.org and is republished here with permission. View the original post and podcast transcript here.